One month after debuting in the Netherlands, Apple's specialized Apple Support app has gone live in the U.S. App Store, reports TechCrunch. The app gives Apple users an easy way to get support for their devices on the go. The app is designed to mimic Apple's dedicated support website, providing a list of Apple devices owned by the user and giving them access to documentation for those devices. 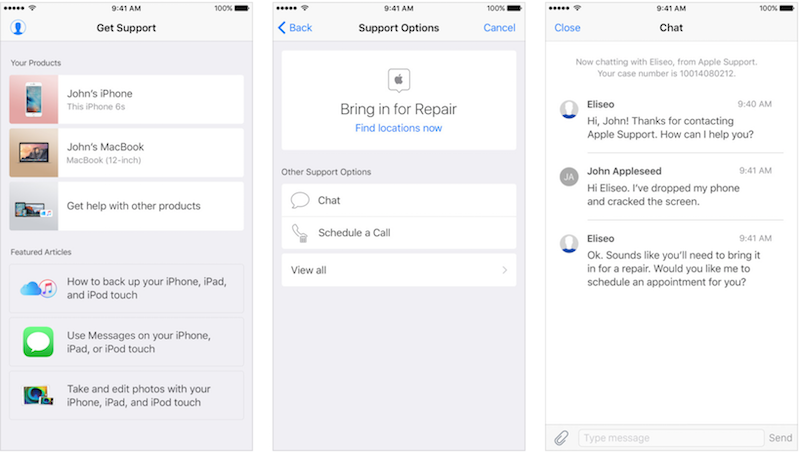 The app also allows users to schedule repairs in an Apple retail store or natively chat with Apple's support staff. Once they conclude their chat session, users can see their recent support history. The Apple Support app was first rumored last November, when Sonny Dickson debuted screenshots of the app early in its development. Uhhh hi Apple Support. I updated my computer and it no longer tells me how much battery life I have left. I really gotta stop reading the comments on this website. It's nothing but negative whiners haha. Somehow this app being released is Apple admitting that they are terrible and are doomed and just not the same since Steve died. Man, it's so far from the average person's perception it isn't even funny. Just a cesspool of negativity. Seems to be for the iphone and ipad, not for the Mac. No more comment necessary. Probably will be the number one downloaded app in the app store. Oh wait, that's not good is it? I like this idea! Nice one. This is nice. I was upset when they pulled the genius appointment stuff from the Apple Store app. I guess this is why. I really have to stop reading the comments on this website. It's nothing but negative whiners haha. Somehow this app being released is Apple admitting that they are terrible and are doomed and just not the same since Steve died. Man, it's so far from the average person's perception it isn't even funny. Just a cesspool of negativity. Yeah, how dare someone express negativity or their opinion. Thoughtcrime be damned. Agreed. I might just stick to my threads and occasional funny posts. Their servers are going to be overloaded this holiday season for sure. I think I might use it now. My iPhone 6 is having some odd battery behaviors. I'll update this post when I'm done. EDIT: Good News Everyone! The App works perfectly. The Bad News is that they said my iPhone's diagnostics determines that it does indeed need a battery replacement.